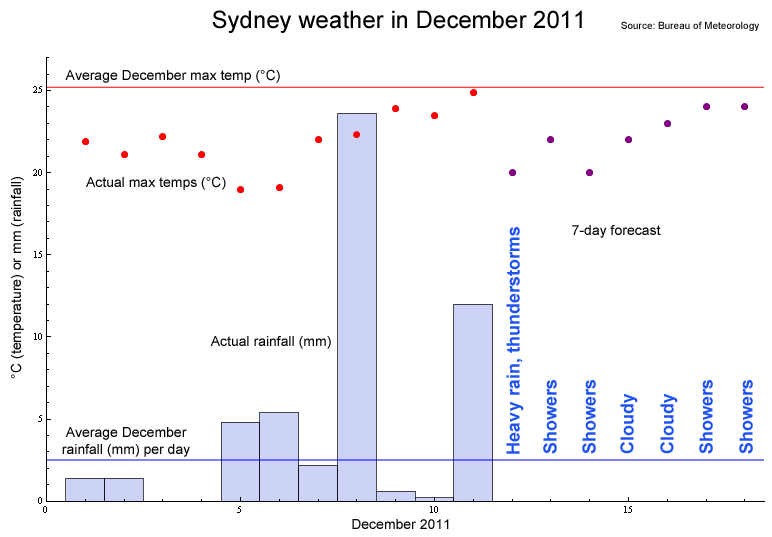 This entry was posted on Monday, 12 December, 2011 at 09:48	and is filed under Science. You can follow any responses to this entry through the RSS 2.0 feed. You can skip to the end and leave a response. Pinging is currently not allowed. It’s strange and interesting how the perceptions differ: I’d say that’s a pretty nice summer weather, though the rain might be a bit much. How *should* the summer weather look like, then? Then again, I don’t like Sun that much, if it shines down from the sky. We just had a holiday trip for a week, and the weather was a comfortable 20-25 C, usually with clouds. The couple of days when the Sun shone were pretty hot and uncomfortable for me not to be in the shade. Lack of rain was somewhat of a problem, though, mostly for the locals, of course. Grass gets pretty dry soon if it’s not watered. Well the average is 25.2°C, so we’d normally expect several days approaching or over 30°C, and even into the high 30s. And not nearly so much rain.